One of the most tedious parts of applying for the PMP exam is filling out the application. It requests a bunch of information about each project you have worked on. The worst part is that it presents it one screen at a time, so it is difficult to figure out how many hours you have entered in what domain. On top of that, you may find yourself stuck in it trying to dig up a phone number or address for the contact person and finding your session timing out. It has two tabs. One for the project and contact information. 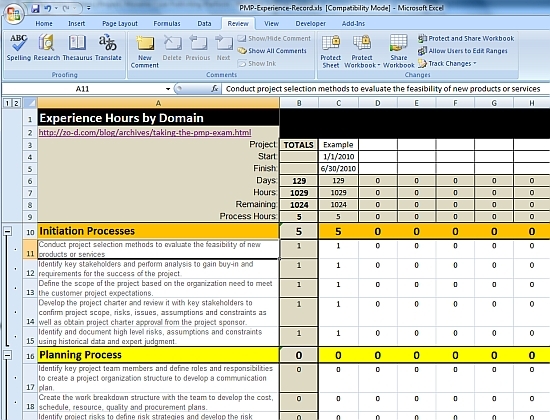 Fill it out for each project to make sure you have the information at your fingertips. The second tab is for the experience hours. It breaks them down into the same domains that the on-line form uses and contains the descriptions. You can start using this even before your exam application to see how close you are. The spreadsheet then totals the hours and offers a sanity check of hours entered against the time that you spent on the project. For example, if you worked on a project for two and a half months, the spreadsheet will calculate the number of working hours and compares that against what you have entered as individual hours. The previous article is Between Solstice and Year End. The next article is Books to Consider – Decision Making.